When a powerful storm rolls through, it reminds us just how unpredictable Mother Nature can be. The storm itself may cause thunder, lightning and strong winds, but it’s the aftermath of the storm that is most feared. Will there be flooded streets and tunnels? Will trees fall onto homes? Will strong winds knock down power lines? To assess the damage that has been done by a storm, you will have to get a good look at the property around you. However, the area can be dangerous, and key threats need to be identified. Here are a few tips for remaining safe when estimating storm damage. Perhaps the greatest threat to be aware of is downed utility lines. The first thing that professionals do when they arrive on scene is identify all of the power lines. If you find that wind or trees have tampered the utility lines, it’s best to call in a professional or wait for the electric/phone company to respond. Although an electrical conductor lying on the ground may look harmless, it’s dangerous to touch. Phone lines can also be deadly since they can be energized and carrying an electrical current. Even lines that are down and disconnected from the feed side could be receiving backfeed or getting re-energized from a local generator. Bottom line: Never assume that a utility line is harmless. These lines are considered “hot” and should be left to a professional. Fences can carry a charge from generators coming online from down the block if wires come into contact with it. Many people look on the ground to assess the damage, or at least as far up as the roof of their home. Yet trees are known for getting broken limbs during storms, and they can let loose and come crashing down at any minute. When heading outdoors, be sure to look up and assess damage to the trees. Loose limbs and branches can be trimmed off, making the tree stable once again. If damage is done to the trees, you hope that it’s just minor infractions that can be easily fixed up. If a tree is uprooted or knocked down, things get trickier. Before you take a chainsaw to the tree, you may want to call in a professional. Trees that have been knocked down have an unnatural pattern of pressure points, and if you can’t pinpoint where the tension is, you could be in danger. This happens because the tree may experience a violent reaction when it is cut, something called spring poles. Only trained professionals should work with spring poles since the consequences can be deadly. Additionally, it’s difficult to analyze the weight and fulcrum points of an uprooted tree, so the weight can easily shift, leaving the layperson unprepared for the consequences. Naturally, arborists don’t want to see trees causing more damage to homes and structures, but the greater concern is the safety of people. No one needs to threaten their safety or independence from trying to clean up after a storm. Fall rain storms are not the only types of weather that can cause damage to trees and power lines. As the winter weather moves in, it’s common for snowstorms to bring in heavy winds and piles of snow that sit on the tops of tree branches, limbs and power lines. The same caution should be exercised after a winter storm as well, and you should practice looking up so that you’re aware of any trees that have been made vulnerable from piles of snow. Knowing when to call in a professional can be tricky, but keep in mind that a damaged tree is always more difficult to take care of than one that is standing. If you do try to remedy a situation, work within your own limitations, and don’t take unnecessary risks. A professional arborist can assist you in knowing which branches to remove, so be sure to contact one if you’re unsure about any of the tasks at hand. Look for an arborist that carries the ISA Certified Arborist credential to ensure quality work ethics. 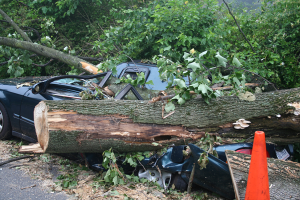 Check out the Summer, 2013 edition of Trees and More… to learn more about storm damage safety.